The SteelSeries Apex M750 TKL Gaming Keyboard offers fantastic gaming performance in a smaller size for added portability and extra mouse movement space. There’s no question that mechanical keyboards are popular, especially amongst gamers. While keyboards without number pads are widespread on most laptops, mostly due to the size of smaller laptops, for the most part, most external keyboards are full sized. Depending on what games you play, you may not need a number pad and that’s where tenkeyless keyboards come in. Our SteelSeries Apex M750 TKL review takes a look at a mechanical gaming keyboard sans number pad for more compact gaming spaces or for use simply to keep your mouse and keyboard hands closer together for more comfortable gaming. 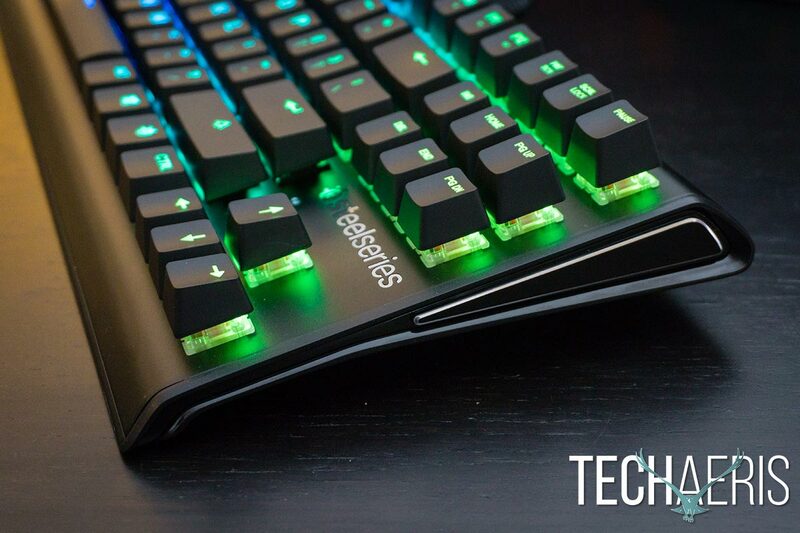 The SteelSeries Apex M750 TKL Gaming Keyboard uses the floating key design. The base of the all-black keyboard is constructed from aircraft grade aluminum which slopes slightly downward. Of course, the first thing one notices about a tenkeyless keyboard is the missing number pad on the right hand side. This makes for a keyboard that’s less wide than a full-sized keyboard which allows you to place your mouse a bit closer than normal or utilize a bigger mousepad for more mouse movement area. As such, there’s also less room for other keys. 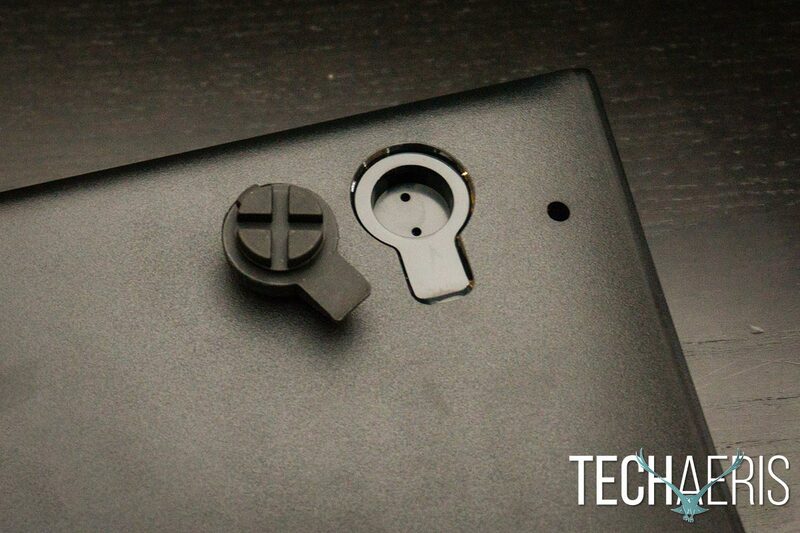 However, the design does manage to keep every key that you may need, including your ins/del/home/end and other keys. 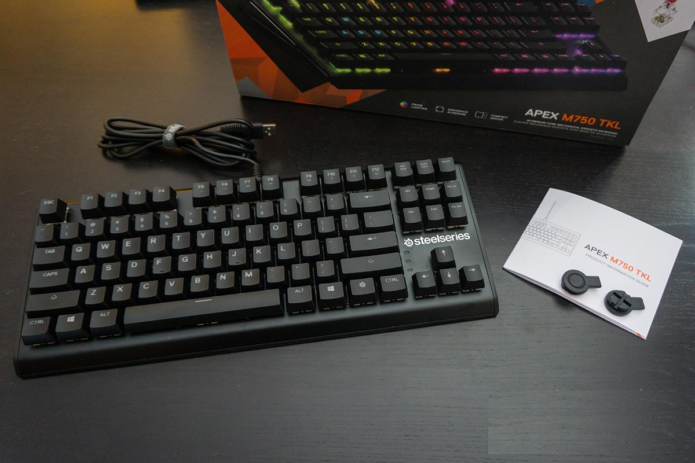 The SteelSeries Apex M750 TKL Gaming Keyboard. As such, the keyboard layout looks pretty similar with five standard rows for your letter and number keys and a top row for Esc and your Fn keys. On the bottom row, you’ll find the standard Ctrl, Windows, and Alt key to the left of the spacebar, while on the right you’ll find another Alt, Windows, function (with the SteelSeries logo instead of the usual Fn letters), and Ctrl keys. 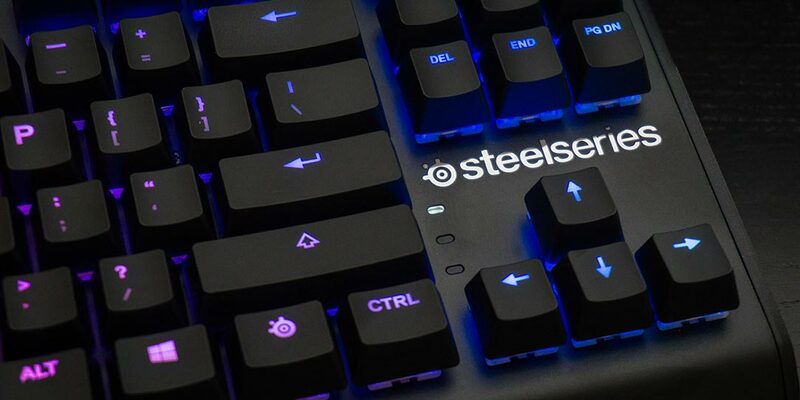 On the far right side of the keyboard are your arrow keys near the bottom, the SteelSeries logo in silver just above that, with your six-key ins/del set and your Print Screen, Scroll Lock, and Pause keys above that. To the left of the arrow keys and to the right of the right shift key are three LEDs stacked vertically, the top for Caps Lock, middle for Scroll Lock, and Windows key lock. Oddly enough, that last one took some figuring out as there’s nothing in the Product Information Guide about it. Each side of the keyboard features a stylized triangle shape which narrows and curves down slightly towards the front of the keyboard. Centered inside each edge is a black triangle aluminum plate with slightly beveled silver edges. The bottom of the keyboard is pretty standard, although instead of feet tabs which pull out, the Apex M750 TKL features a pair of removable rubber feet at the back. The installed feet offer a lower profile while the extra set that is included raises the back of the keyboard up more for a more angled approach. The Apex M750 TKL has an interesting feet design. The keyboard also features individually controllable per-key RGB illumination. In addition to switchable presets, each key can be customized to a specific RGB colour using the SteelSeries Engine 3 software. Finally, the roughly 6 1/2′ USB cable is attached to the center of the back of the keyboard and includes a SteelSeries velcro loop for wrapping up any extra slack you may have depending on your setup. Overall, the Apex M750 TKL has a nice weight to it without being too heavy and feels nice and sturdy, as well as looks fairly slick and decent with its black aluminum finish, floating key design, and RBG lighting. 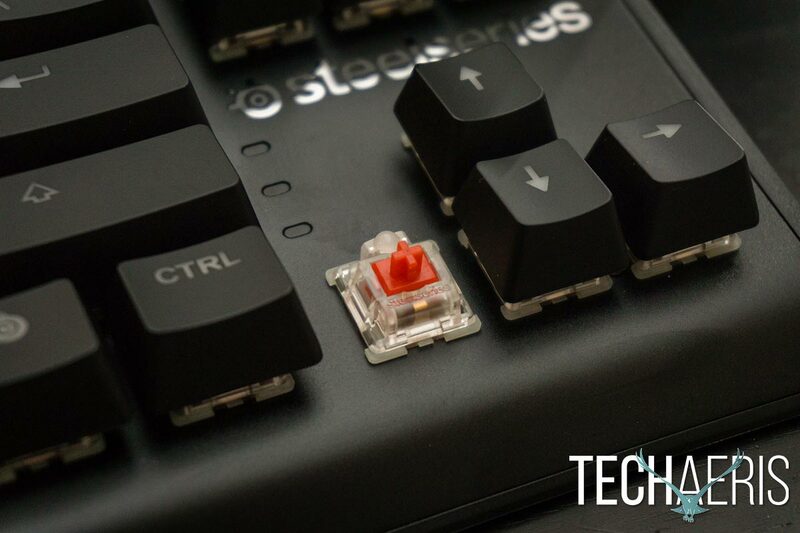 The SteelSeries Apex M750 TKL mechanical gaming keyboard can be as easy to use as plugging it in to an available USB port on your computer. You can control the backlight and key lights without any additional software required, which is a nice feature. 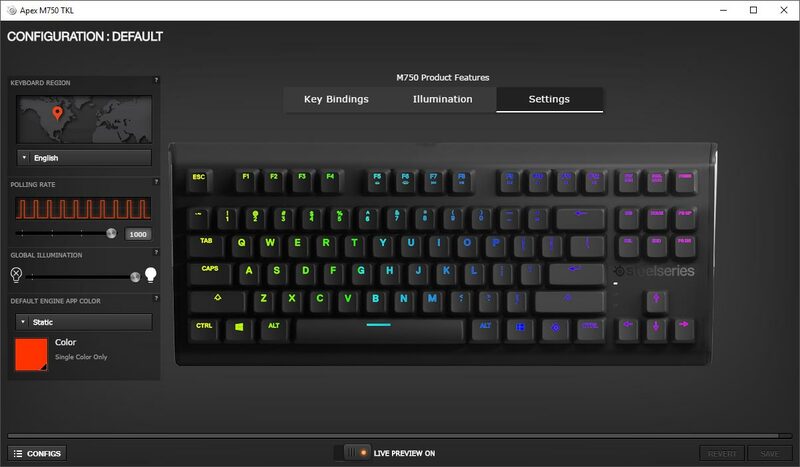 By holding down the SteelSeries function key, you can increase the backlight speed using the Prt Scn button, change backlight mode using the Ins key, and change the backlight colour using the Del key. As is usually the case, you’ll want to install the SteelSeries Engine 3 software to take further advantage of the keyboard. Doing so will let you take advantage of other features like GameSense integration, custom lighting effects, customization of keyboard settings, and key remapping and macro programming. We’ve looked at the SteelSeries Engine 3 software more than a few times here at Techaeris for other SteelSeries keyboard and mice reviews. Nothing much has changed and it’s pretty straightforward and easy to use. After you’ve selected the Apex M750 TKL from the list of devices, you’ll be able to easily choose one of eleven illumination presets or customize both active and reactive lighting to your liking. Even though there are no dedicated macro keys — something I’d personally like to see — you can remap and assign macros to specific keys. Because you can save different configurations, you don’t have to worry about setting up a macro to a rarely used key but rather set it up the way you like on a per game basis. On that note, a new feature we did notice in the SteelSeries Engine 3 is the ability to map a device and a specific configuration on a per game basis. Doing so will automatically load that configuration once that game is loaded for the keyboard, making it easier and quicker to get in the game. Unfortunately, it doesn’t detect all games, for example those installed from the Microsoft Store like Forza Motorsport 7 or Gears of War 4. 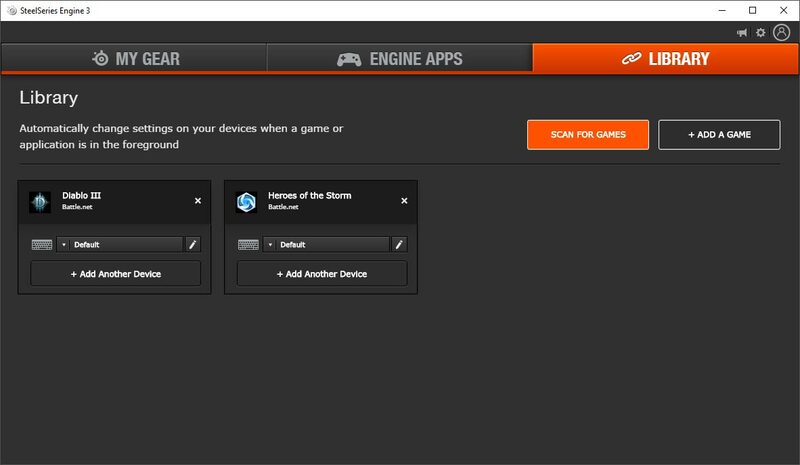 A recent update to the SteelSeries Engine 3 lets you assign configurations per device for specific games. Within the app, you can also set the polling rate as well as the global keyboard illumination levels — something you can also control using the Fn and F5/F6 keys. As a result, the keys are definitely nice and clicky and have a quick reaction time. Whether typing or in-game, keys are quick to register and there was no noticeable lag between key press and action, even when using macro-assigned keys. In addition, with the 104 N-Key rollover, the keyboard has no issues keeping up with the fastest typists. Even though I missed the number pad for day to day computer use, during gaming I did rather quickly enjoy the increased space I had for my mouse movements, as well as the slightly added comfort with having your mouse hand closer to your typing hand. 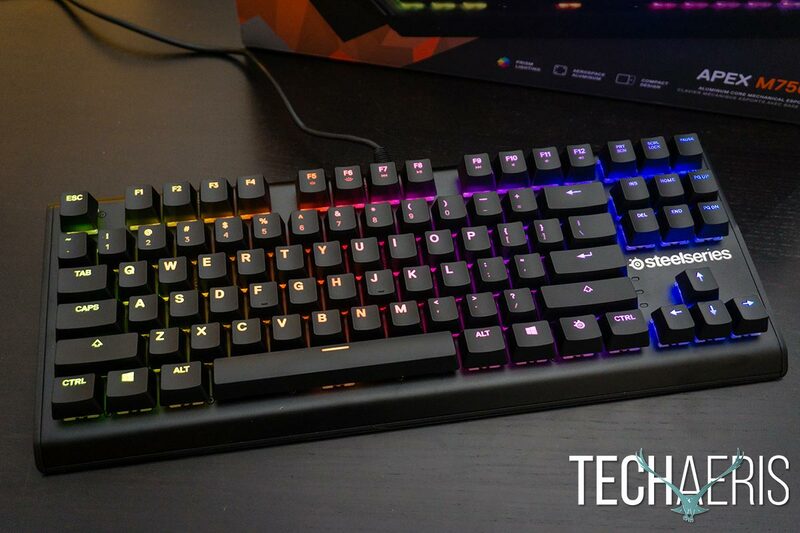 The SteelSeries QX2 Linear Mechanical RGB Switch. With an MSRP of $119.99USD, the SteelSeries Apex M750 TKL Gaming Keyboard is priced right alongside other full-sized mechanical keyboards. While there are cheaper options out there, the performance and compact size of this keyboard is well worth it if your primary use of your PC is gaming and you don’t mind not having a number pad on your keyboard. Side view of the Apex M750 TKL showing the floating key design.